The latest Silicon Valley company to hop on the virtual reality bandwagon is AMD, this morning unveiling what it's calling "Liquid VR": a software development kit aimed at making VR easier for everyone. The announcement comes from a presentation at GDC 2015 in San Francisco, where virtual reality is dominating the news. What does Liquid VR do for developers and users? It essentially makes everything much easier. 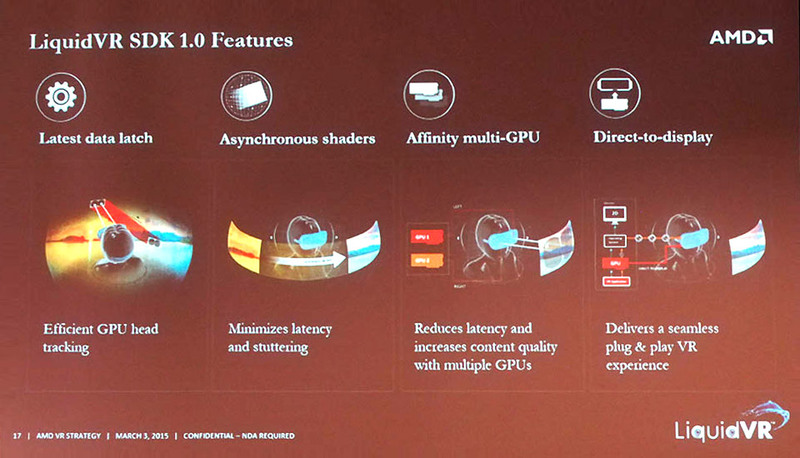 As one AMD rep put it during this morning's presentation, "You can plug an Oculus Rift into a computer and start 3D rendering directly to the headset, even without Oculus' SDK." In so many words, Liquid VR is yet another solution for making various VR headsets work easily on various devices; it also optimizes the use of that headset for that particular computer (no doubt powered by AMD's chips).